Last week, the Syrian Network for Human Rights issued its 2016 report, which documents human rights violations by everyone participating in this war. When you look back at the past 12 months, what are your conclusions about 2016 in relation to other years of this war? In 2016, we lost 17,000 Syrians, but the level of casualties is lower than previous years. The main reason for the drop is the significant number of displaced civilians across Syria this year. We often get questions along the lines of: “How is it possible that the 13,000 barrel bombs that hit Syria this year only killed so many civilians?” This year, barrel bombs not only claimed many lives, but also destroyed buildings and infrastructure. However, due to the fact that Syrians have relocated to other regions or abroad, the number of casualties is less, even though the level and frequency of bombing are the same as they have been for years. We didn’t notice a big difference in the number of deaths due to torture in regime prisons. The regime has continued its practice of torture, often resulting in death, in their prisons. There are approximately 90,000 in regime prisons alone, about 500 of whom died due to torture last year alone. It’s a terrifying figure. The rest of the parties [involved in the conflict] have approximately 20,000 prisoners. Syria has the world’s worst rate of torture-related death. No other country comes close. Those who have died due to torture are included in the total number of casualties. Additionally, there are unlawful arrests, which have continued at the same pace for the last few years, with 10,000 arrested by the regime last year, also a horrifying number. In the annual report, we also noted a larger role played by Russia than in previous years, in their coordinated bombardment with the regime. Additionally, there was an increase in involvement from Iranian, Iraqi and Lebanese Shiite militias, along with Russia, in the country’s governance. Syria has the worst global rates of cluster and chemical weapons use. We also spoke about Russia’s use of cluster munitions in the report that we put together this year. Throughout the course of the year, 1,373 civilian areas were the targets of airstrikes. Civilian medical points were among the most targeted areas this year, with around 89 medical sites targeted, including hospitals and clinics. In 2016, we saw rebel-held east Aleppo, the last major urban stronghold of the opposition, fall to the Syrian regime. Foreign powers, namely Turkey and Russia, increased their military and political influence in Syria. We also witnessed multiple towns in Outer Damascus accept regime-negotiated surrenders, evacuating rebels and their families to Idlib province. What does the next stage of the Syrian war look like? Where is this war going? The war is moving toward more confusion, especially considering what we’ve seen with the restructuring of [opposition] factions in Syria. As I see it, this is what the regime, Russia and their allies are pushing for in a big way. In this sort of situation, there will certainly be divisions and infighting. This has been shown to be the case, sociologically speaking. When you have one supply of resources and that supply is limited, then you will fight in order to garner more support and more resources. This is the reality we’re now seeing on the ground in Idlib with Fatah a-Sham. It also benefits the regime to assemble all of these people in Idlib, as it provides justification for their bombardment of these regions. Al Qa’eda in Idlib has expanded as a number of factions merged with Hay’at Tahrir al-Sham, a faction affiliated with the terrorist organization. It’s clear that these factions are jeopardizing themselves. If you join Al Qa’eda, then you become Al Qa’eda. There will be no telling you apart from the faction that you once were. You’re also adding the international coalition, with its precision airstrikes, to the list of people bombing your members and leaders. For instance, Nour ed-Din al-Zinki and Liwa al-Haq joined Hay’at Tahrir a-Sham. They had their reasons for joining, maybe threats to their group or fear that the faction would become defunct. But the international coalition will view all the factions that joined Al-Qaeda as Al-Qaeda, and will not differentiate when they strike. Without a doubt, Syria will be all the worse because of this disaster. As I see it, it will be one of the worst things to happen to the Syrian revolution. It means that members and leaders of the popular revolutionary base as well as civilians will not only be targeted by regime and Russian bombardment, but also the international coalition. We’ve seen the coalition target Hay’at Tahrir a-Sham without any differentiation. Last month, the international coalition caused more civilian deaths than Russia for the first time. Whereas Russia has not been able to sufficiently justify their targeting of certain factions, it now has more of a pretext and justification than before for indiscriminate bombing. Would you then say that the regime has been using Idlib as a dumping ground for unwanted opposition? The province is completely controlled by the opposition, so the regime looks to it as a suitable place to gather its undesired population and anyone who opposes it. This has a catastrophic societal effect, as I previously mentioned. There’s also the pressure on residents due to the lack of resources, services and infrastructure. This means more internal conflict, which will in turn provide justification for further bombardment. This is what’s happening Idlib; a result of a deliberate policy by the regime that serves their best interests. The Syrian Network for Human Rights has been covering the Syrian war since June 2011. As the conflict enters its seventh year, where should journalists inside and outside of Syria focus their attention? There are a few different areas that Syrian journalists should prioritize and focus their attention on, particularly as media coverage tends to gravitate toward extremist organizations that have entered the Syria conflict. The first is chemical weapons use in Syria. Some have begun to consider it normal, and do not bother shedding light on the topic. But we can never normalize it. They are internationally banned weapons and a red line in the eyes of the UN Security Council. Regarding journalists abroad, I haven’t found a systemic critique from foreign journalists about how global policies have left the Syria people to face the fallout of this catastrophe. There is a privileged way in which international journalists view Syria’s catastrophe. Some are influenced by Russia or the global right, while others follow the black flags [support the Islamic State or other Islamist extremists], and so they stay silent. [International journalists] should be harshly critiquing the policies of the countries where they live so that these nations start working toward ending the disaster. Until now, I haven’t seen any earnest criticism of the policies of the United States, Russia and the West. Foreign journalists have the moral responsibility to critique the political institutions of their own countries because these institutions play a real role in Syria. This is where they need to channel their focus. Q: For more than six years, you’ve been documenting the atrocities of the Syrian war. In 2016 alone, SN4HR documented almost 17,000 civilian deaths. How are you able to continue this work year after year? How does this work impact you emotionally? It is still difficult, personally and psychologically. In April 2013, I was putting together a list of documented casualties and I saw the name of my friend among them. I was shocked and then fell into depression after losing this friend and having to find out in such a way. In 2012, one of my close friends was imprisoned and, though some say that he passed away, his fate is unknown. This has a troubling effect on the psyche. I feel pain for those people that I don’t even know, especially the children who become victims. It’s part of human nature more than anything else. When you document the children dying in the ugliest of circumstances, the pain can only grow. It’s not in your hands, and you can’t do anything about it. We take little time to rest and recover from our work. We work every day of the week and we don’t stop. If we do rest, it’s for a few hours only and then we return. The death, the human rights violations do not stop. We can’t, either. What pushes me to work despite all of the difficulties is my love for my country, Syria, and its people. It’s the feeling of doing my duty to my country without asking anything in return. 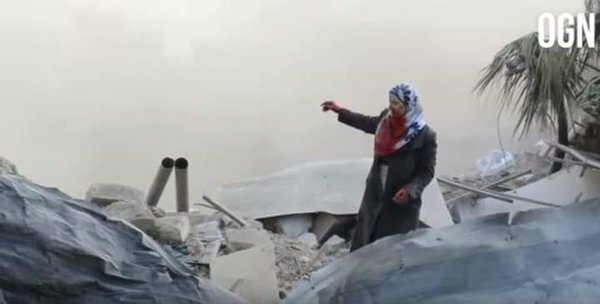 I always think to myself that there are hundreds of massacres that have not been recorded, hundreds of residential areas targeted, victims who died without any record. For these reasons, my work is an indispensable part of my everyday life, and I have become accustomed to it despite all of its difficulties.